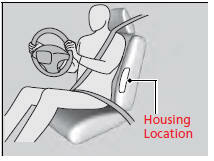 The side airbags are housed in the outside edge of the driver's and passenger's seat-backs. Both are marked SIDE AIRBAG. Do not attach accessories on or near the side airbags. They can interfere with the proper operation of the airbags, or hurt someone if an airbag inflates. If the impact is on the passenger side, the airbag deploys even if there is no passenger’s in the passenger seat. Do not cover or replace the front seat-back covers without consulting a dealer. Improperly replacing or covering front seat-back covers can prevent your side airbags from properly deploying during a side impact.